Tampa Bay Buccaneers QB Jameis Winston and RB Doug Martin put the Bucs up early and they never looked back. Two Nick Folk field goals kept them ahead (despite some kicking problems), and even with Jacksonville Jaguars QB Brandon Allen throwing a touchdown in the fourth quarter to Marquez Williams, the Bucs came away with the 12-8 victory. Winston looked sharp for the most part, moving the chains at the intermediate level, particularly the 10-19-yard range in the middle of the field where he completed 8-of-11 passes for 111 yards. The big question for this year is if Winston can cut down on the turnover-worthy plays this season after having the 17th-highest percentage out of 39 qualifiers last year. He had two poor decisions in this one, first on a play that was luckily ruled a sack but had him heaving an intercepted prayer into the end zone on his way down and he had another interception dropped on an ill-advised pass into tight coverage. Those are the plays that need to disappear in the regular season in order for Winston to maximize his potential. Bucs fans got their first look at Howard as a receiver as he caught two of his three targets for 28 yards. He snuck out of the backfield into the flat for a 15-yard gain and followed it up with nice 14-yard gain over the middle of the field to against the blitz. That middle-of-the-field presence will be crucial for Winston’s development this season. In the run game, Howard had his hands full with Jaguars DE Calais Campbell, but held his own on a number of zone blocks, his strength coming out of Alabama as the top-graded run blocking tight end in the nation last season. David looked like he was already in mid-season form on Thursday night. He played just 24-of-62 snaps, but managed a game-high four defensive stops, and added a sack and broke up a pass in coverage. 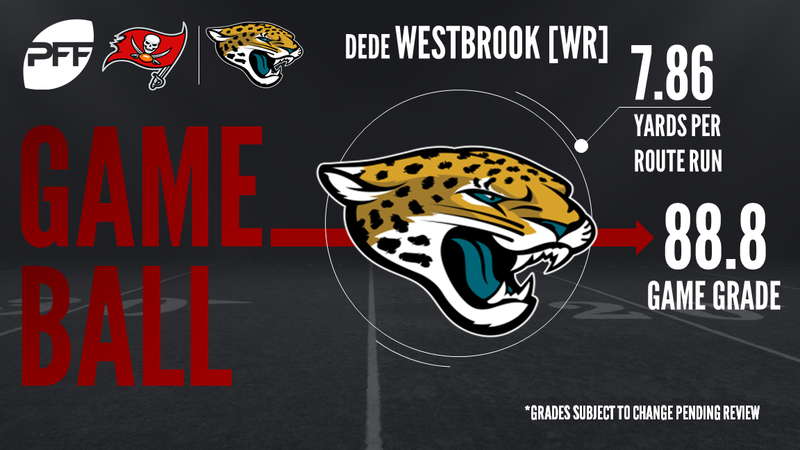 Westbrook couldn’t quite haul in the pass that would have tied the game up and given the Jaguars an opportunity to take the lead, but he still caught all of his six other targets, totaling 131 yards on the night. Allen didn’t enter the game until the fourth quarter against the Bucs’ reserves, but helped the Jaguars offense, which struggled for much of the game, move the ball pretty well. Allen completed four of five passes targeted 20-plus yards downfield for 98 yards, with the lone incompletion coming on the hail mary at the end of the game. Building on his strong performance last week, Fowler got after the quarterback with two hurries and a strip sack to go with two more hurries that were negated by penalty, including one that induced a holding call. He played with power at the point of attack in the run game as well, jacking up tight ends and squeezing the backside on a number of runs. Day finally showed the kind of disruption he showed when at Notre Dame as he continually moved blockers backwards to shut down running lanes and he added a cleanup sack and a quick pressure that led to a hold by RG J.R. Sweezy. Day needs more games like this if he’s going to earn a spot in the defensive line rotation this season, but his is the kind of performance that made him a potential mid-round steal from the 2016 draft.